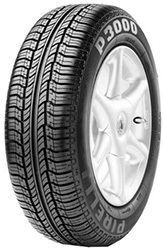 Part of the new generation of green perfomance tyres from Pirelli and featuring a symmetrical tread pattern with two wide longitudnal grooves and well spaced tread blocks, the Pirelli 3000 also contains the adaptaive tread compound, allowing the tyre to react to the road surface you're driving on. This adapative technology not only imporves safety along with wet and dry handling but also significantly enhances the tyres life span, enabling more even tread wear and giving you more miles from each tyre. Low rolling resistance helps both you and the enviornment, with less CO2 emissions and fewer trips to the pump required.